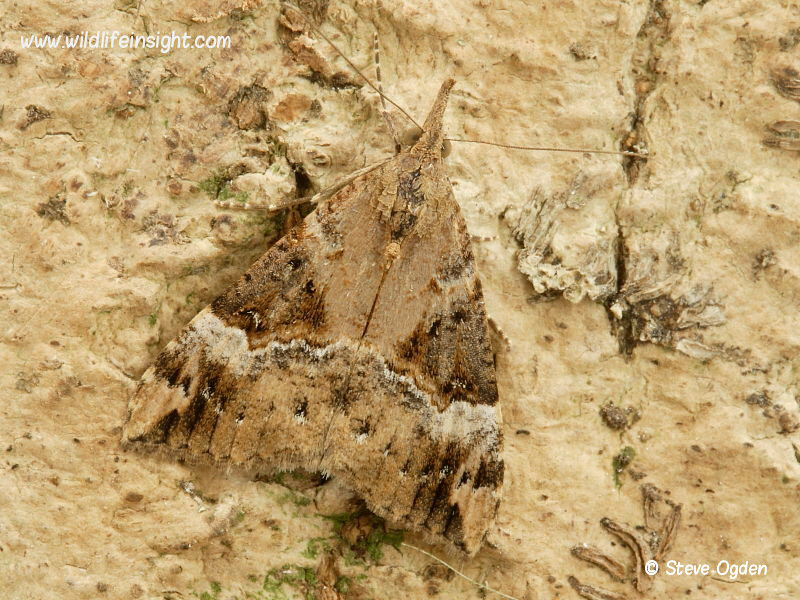 In recent years The Bloxworth Snout (Hypena obsitalis) has been spreading along the south coast of the UK. The species is double brooded with the first brood flying from September to June, hibernating during the colder months, with a second brood in July/August. The Bloxworth Snout has a forewing length of c 16mm and has two forms as shown in the photographs of specimens from south west Cornwall. The larval foodplant is Pellitory of the Wall and Common Nettle. I first recorded The Bloxworth Snout when I moved to Falmouth in south west Cornwall. Here, I often disturb them hibernating in the garden shed and sheltered wood pile. However, despite recording this species annually overwintering in the garden I’ve still to attract one to either an actinic or MV light. The reluctance of this species to come to light suggests it may be far more common than records indicate. Indeed, subsequent searches for the caterpillars (larvae) have confirmed the species to be breeding in several areas locally where the adult moth hadn’t previously been recorded. Consequently, it wouldn’t be surprising to find The Bloxworth Snout to be widespread along much of Cornwall’s South West Coast Path where Pellitory of the Wall is often plentiful in the hedges and walls. The caterpillars of the Bloxworth Snout grow to c 25mm in length. Main features include – a rudimentary pair of prolegs on the 6th segment, a single dark green dorsal line, a greyish/light green head with dark speckling, and black pinaculae each with a pale/grey hair. The larval foodplants are recorded as being Pellitory of the Wall and Common Nettle. Having yet to record this species on nettle I wonder if in the past I’ve overlooked them, assuming they were Snout larvae. As well as helping to confirm its status, finding the larvae and rearing through also highlighted features that would help identify them from those of The Snout, Hypena proboscidalis, when found on common nettle. The following general differences have since helped seperate Bloxworth Snout larvae from those of The Snout (shown right). A consistent difference is the much paler setae (hair) of H.obsitalis. The sub spiracula area is a much paler green. H. obsitalis is overall a more subtle green than H. proboscidalis. The white sub dorsal and spriracula lines of H.obsitalis are often faint or non existent and generally much bolder on H. proboscidalis. An unexpected bi catch recorded during sweeping Pellitory of the Wall during late August/September along parts of the South West coast of Cornwall were the large numbers of Red Admiral caterpillars. Surprisingly, the Pellitory of the Wall hosted many more Red Admiral larvae than adjoining beds of Common Nettle. Large numbers of Cosmopterix pulchrimella larvae were also evident feeding amongst heavily mined leaves. Within a few days many of these tiny moths soon began emerging from pupae formed amongst the leaves. The second brood of caterpillars of the Bloxworth Snout swept from Pellitory of the Wall on August 30th began pupating on September 5th. The pupae were formed in a loose cocoon amongst the larval foodplant. The adults began emerging in 18-20 days.